Read for This Week's Study: Matt. 5:17-20, Luke 16:16, Matt. 5:21-32, Rom. 7:24, Matt. 5:33-37, 5:38-48. Memory Text: Do not think that I came to destroy the Law or the Prophets. I did not come to destroy but to fulfill. For assuredly, I say to you, till heaven and earth pass away, one jot, or one tittle will by no means pass from the law till all is fulfilled (Matthew 5:17-18, NKJV). When most people think about the Sermon on the Mount, they automatically think the Beatitudes (Matt. 5:1-12). However, the Sermon on the Mount actually covers three chapters that have been divided into four sections. The Beatitudes comprise only the first section. In the second Jesus compares Christians to light and salt (Matt. 5:13-16). The third, Matthew 5:17-48, is where Jesus gives us a new and deeper perspective on the law. And then there is the final and longest section, Matthew 6:1-7:23, in which Jesus provides clear teaching on Christian behavior. The whole talk ends with the parable of the wise and foolish builders (Matt. 7:24-27), which stresses the importance of obedience to what God calls us to do. This week we will investigate the third section, Matthew 5:17-48 (which theologians call the antitheses, cases in which sharp contrasts are presented), to see what it teaches us about the law. *Study this week's lesson to prepare for Sabbath, April 26. Read again Matthew 5:17-20. How interesting that Jesus would greatly emphasize the law here, while at the same time making the statement that He did about the scribes and Pharisees, who so greatly emphasized the law, as well. What important lesson does this passage teach about true obedience to the law? Jesus begins this section with the assurance that He has not come to abolish the Law or the Prophets (Matt. 5:17, NKJV). Although there is no reference to it, many see this as a formulaic expression for the entire Old Testament (see also Matt. 7:12, 11:13, 22:40, Luke 16:16, Acts 13:15, 24:14, Rom. 3:21). In spite of what His opponents claimed, Jesus did not attack the very book that revealed the will of His Father. Instead, His purpose was to fulfill the law and the prophets, not to do away with them. The word used for fulfill (plero) literally means to fill up, or complete. It carries the sense of filling to the brim. There are two ways to understand fulfill. One is to place the emphasis on Jesus as being the fulfillment of Scripture (for example, Luke 24:25-27, John 5:39). However, the key to understanding this text lies in the immediate context, which shows that Jesus did not come to destroy Scripture but to reveal its inner essence. Having established His overall intent, Jesus switched emphasis from the Old Testament in general to the law in particular. Almost as if He knew that people would one day accuse Him of abolishing the law, He cautions that as long as heaven and earth remain, the law will exist until everything is accomplished (Matt. 5:18, NIV). With this statement, Jesus confirms the perpetuity of the law. In fact, the law is so important that all those who violate its precepts will be called the least in the kingdom. This is just a way of saying that they are wrong in what they are doing. Jesus is quick to point out that He is not promoting the empty righteousness of the scribes and Pharisees but instead a righteousness springing from a heart that loves God and seeks to do His will. After He clarified His intention to uphold the law, Jesus started to explain a righteousness that exceeds that of the scribes and Pharisees. He begins by citing the sixth commandment (Exod. 20:13) and summarizing, from the law of Moses, the penalty for violation (Exod. 21:12, Lev. 24:17). The sixth commandment does not include all cases in which one person kills another. In cases of manslaughter, a person could flee to a city of refuge and gain temporary asylum (Exod. 21:13, Num. 35:12). However, one who intentionally took another's life would receive swift judgment. In His explanation, Jesus does not focus on the act itself but on the motive and intents of the one who commits the act. One might take a life accidentally, but the person who purposes to take a life has gone through a period of deliberation. The sin took place before the person even carried out the terrible deed. Many potential murderers are stopped only by a lack of opportunity. Read Matthew 5:22. What does Jesus equate to murder? How does 1 John 3:15 help to emphasize the point? What is the real issue here that Jesus is pointing to, and what does this tell us about the real reach of God's law? Though the Bible often talks about the power of words, Jesus here takes it to a deeper level. Often, the sole purpose of harsh words or cursing is to evoke negative feelings in the victim. Jesus' point is crystal clear. It's not just those who carry through with the crime who are guilty of murder but also those who speak harsh words to others or who even harbor murderous thoughts. Jesus counsels those harboring these thoughts to reconcile with their victims before coming to the altar (Matt. 5:23-26). Dwell on the implication of Jesus' words in the texts for today. How well have you done in this regard? What does such a high standard tell you about the need to be covered by Christ's righteousness at all times? Jesus' next example involves commandments concerning adultery. He first cites the seventh commandment, You shall not commit adultery. In the context of the law of Moses, adultery took place when a married person was sexually involved with someone other than a spouse. The law was very clear that both parties found guilty of adultery should be put to death. As with the sixth commandment, Jesus gave the deeper implications of this particular commandment. Adultery often starts long before the acts are committed. In the same way that murder starts with the intention to inflict permanent harm on an individual, adultery begins at the very moment when an individual lustfully desires another person, married or single, to whom he or she is not married. Read Matthew 5:29-30. How much more forceful could Jesus be in describing the danger of sin? After looking at these texts, read Romans 7:24. What important truths are found here? Here, too, Jesus provides an instant remedy for those sins that have been exposed. The solution is not to follow through with the sin but to have a conversion of the heart. With strong metaphors, Jesus counsels the one who has the problem to do what is necessary if she or he wishes to enter the kingdom. This may mean taking a different route to work or terminating a cherished friendship, but eternal gain far outweighs the passions of the moment. As we saw before, Moses permitted divorce even though he knew it was not a part of God's original plan. After addressing married men with roaming eyes and admonishing them to control their impulses, Jesus encourages lifelong marriage fidelity. The surrender of the will is represented as plucking out the eye or cutting off the hand. Often it seems to us that to surrender the will to God is to consent to go through life maimed or crippled. But it is better, says Christ, for self to be maimed, wounded, crippled, if thus you may enter into life. That which you look upon as disaster is the door to highest benefit. Ellen G. White, Thoughts From the Mount of Blessing, p. 61. What implication might these words have for you? The first two antitheses (murder and adultery) are based on the Decalogue. The antithesis regarding divorce and the ones that follow are taken from other sections of the Mosaic law, including the one about swearing falsely and performing oaths to the Lord. Read Leviticus 19:11-13. What specific points do we find here? See also Exod. 20:7. The Mosaic law, from which Jesus quotes, is listed in a section of Leviticus that condemns a number of deceptive practices. Here again it is evident that Jesus' concern is with the intentions. Anyone who makes a promise with no intention of fulfilling it has made a conscious decision to sin. Though the command against swearing falsely relates to promises made to other people, the second command concerns promises made to God. Read Deuteronomy 23:21-23. In what way do these verses relate to Jesus' words in Matthew 5:33-37? See also Acts 5:1-11. Unlike the person guilty of false swearing, the one who makes a financial pledge to God is not necessarily intending to defraud. However, Jesus knows human nature and cautions against making promises that one may later regret. Rather than making promises that may not even be in the power of the individual to fulfill, a Christian should be a person of integrity whose yes means yes and no means no. Think about a time that you made a promise (either to a person or to God) that you intended to keep but ultimately didn't. How can you learn to be careful about this problem? What about promises to yourself that you have reneged on? It appears that the common theme here (Matt. 5:38-48) is revenge. This first theme concerns the many commandments in the Mosaic law that are built on the principle of repaying a crime with an equal punishment, an idea called lex talionis, a Latin term meaning law of retaliation. As we see in a number of passages (Exod. 21:22-25, Lev. 24:17-21, Deut. 19:21), the law called for the offender to suffer the same experience as the victim. If the victim lost an eye, arm, foot, or life, the offender must also. This law of retaliation was common among a number of ancient civilizations. Why not, since it seems to reveal a simple principle of justice? It's important to realize that this principle is there to limit retaliation, that is, to keep people from extracting more from a wrong done to them than they are rightfully entitled to extract. Thus, in many ways, this law was to ensure that justice was not perverted. Therefore, in Matthew 5:38-42 Jesus was not necessarily attacking the legitimacy of a law that demanded a person to be punished for a crime. Instead, Jesus focused on the Christians' response to people who try to take advantage of them. Rather than seeking opportunities for revenge, Christians should retaliate with kindness, something that we can do only through the grace of God working within us. In this appeal, Jesus has taken us to a deeper level in our understanding of what it means to be a follower of the Lord. The final antithesis addresses the attitude that promotes love for friends and hatred for enemies. The command to love your neighbor is found in Leviticus 19:18. There is no explicit text that calls for hatred of enemies, even despite Deuteronomy 23:3-6. In the context of Jesus' world, the Jews were under foreign occupation by the Roman oppressive power and were second-class citizens in their own land. Given their oppression, they probably felt justified in hating their enemy, who at times severely oppressed them. Jesus was showing them a better way to live, even under less than ideal circumstances. Read Matthew 5:44-45. What is Jesus saying to us here? More important, in what way can you apply this teaching in your own life with someone who has done you wrong? Further Study: Ellen G. White, The Sermon on the Mount, pp. 298-314 in The Desire of Ages. Jesus takes up the commandments separately, and explains the depth and breadth of their requirement. Instead of removing one jot of their force, He shows how far reaching their principles are, and exposes the fatal mistake of the Jews in their outward show of obedience. He declares that by the evil thought or the lustful look the law of God is transgressed. One who becomes a party to the least injustice is breaking the law and degrading his own moral nature. Murder first exists in the mind. He who gives hatred a place in his heart is setting his feet in the path of the murderer, and his offerings are abhorrent to God. -Ellen G. White, The Desire of Ages, p. 310. Love is the binding principle in God's law. In each of the antitheses, Jesus elevates the principle of love: love keeps a person from harboring hatred toward her sister; love keeps a husband and wife together; love challenges the Christian to be always honest in his dealings with others and God; love allows a person to react in kindness when he has been wronged; and love empowers the individual to treat the enemy as he himself would like to be treated. In this week's lesson study, Jesus said, You have heard it has been said by them of old, and then later said, but I say unto you, and then gave the antitheses. Notice that some of the sayings of old were direct quotes from the Bible or taken from Old Testament teachings. Thus, the problem was not with the references but with how they had been interpreted. What lesson can we take from this regarding, if not our doctrines, the way in which we interpret them? How might we be in danger of looking at things too superficially and missing the deeper meaning? Many fall into the trap of interpreting texts in isolation from other texts. One such text is Matthew 5:48, where we are told to be as perfect as our Father in heaven. How does the interpretation of this text in its immediate context (Matt. 5:43-48) demonstrate the importance of careful Bible study? How would you respond to a person who claimed that this text was teaching sinlessness? What is the text really teaching, and why does this teaching reveal the true meaning of being a follower of Jesus? How do the texts we studied, particularly about murder and adultery, help to show how wrong those are who claim the law was abolished after the Cross? Patricia lives in central Cameroon. She's a lot like other girls. She likes to jump rope and talk with her friends. But in some ways Patricia is different from other children. She has HIV and often feels sick. Two years ago Patricia's mother died of AIDS, and Patricia and her sister went to live with their grandmother. Her father couldn't pay the girls' tuition at the Adventist school they had been attending, so he sent them to the public school near their home. But the children in the public school shunned Patricia because of her illness. The girl begged her father to let her return to the Adventist school. "The teachers and children in the Adventist school don't tease me," she said. "They pray for me. They help me if I don't feel well or need help. Please, please, let me go to the Adventist school." Finally Patricia's father allowed her to return to the Adventist school. "I love my school," she says. "When I'm feeling well, I'm just one of the children in my class. And when I'm not well, the teachers and the children help me." Patricia's father can't always pay her tuition. So Patricia prays that God will make a way for her to remain in school. Patricia enjoys attending Sabbath School, too. She likes the Bible stories the most. "My favorite story is about Moses," she says. "When he was born he was hidden in a basket and found by the pharaoh's daughter. God saved him from death because his mother prayed for him. "God loved Moses very much," Patricia says with a smile. "He gave Moses a special work to do. I know that God loves me and He has something special for me to do, too. God can use me to help people come to Jesus. I don't know how He will do that, but I know He will." Patricia wants others to know that even if they have problems in life-whether they are poor or sick or have no money-God is with them and will help them. "Trust God and worship Him," she says. "Whatever you do, do it for Jesus. That way others will know that Jesus lives in your heart." Patricia knows that God didn't make her sick, but He can use her sickness to help other people learn about His love. 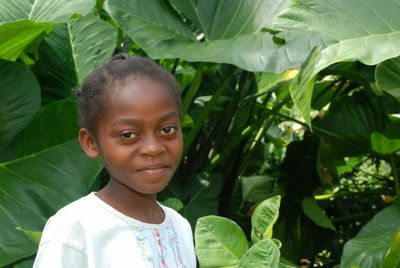 She learned that at the little Adventist school in a village in Cameroon. Our mission offerings help build schools such as the one Patricia attends. Thank you for being a part of something larger than any of us, God's work around the world.